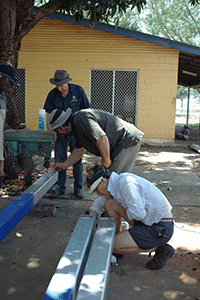 In September 2013 the Bower Studio returned to the Northern Territory, working alongside residents of the Belyuen Community to construct a sheltered outdoor living area / kitchen from the Bower HomesPLUS range of ‘Add Ons’ for the Jorrock family house. 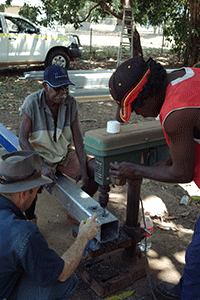 In September 2013 the Bower Studio worked alongside residents of the Belyuen Community to construct a sheltered outdoor living area / kitchen for an Indigenous family from the HomesPLUS range of ‘Add Ons’. The focus of the constructed outcome was on the refining of the training modules, the testing of the consultative processes and the streamlining of the procurement/supply chain. A team of Belyuen residents, with support from University of Melbourne School of Design staff and 11 Bower Studio masters students, constructed the outdoor living / cooking module at the Jorrock house in the Belyuen Community. At the same time the team analyzed the process leading towards a larger scale rollout beyond 2013 and with further local engagement and ‘sweat equity’. This project is one of the many projects we are undertaking in the Northern Territory as part of a larger initiative called HomesPLUS. This innovative, best practice procurement model for new housing and housing upgrades works alongside Indigenous communities throughout Australia to improve the sustainability, quality and quantity of housing. The HomesPLUS goal is to implement a framework where all the stakeholders in Indigenous housing work together to develop homes (rather than houses); homes that empower Indigenous peoples by focusing on their specific needs, capabilities and esteem. We believe housing is a shared responsibility with Indigenous communities and support organizations, who must ‘step-up’ and provide their own ‘sweat equity’ to help plan, build, maintain and repair their homes. The HomesPLUS project takes on the role of providing a framework that facilitates skills development, hard and soft housing outcomes and employment opportunities over the long-term. Participating communities will provide their own ‘sweat equity’ in the form of donated labour in exchange for skills training, a direct say in new or upgraded homes within their own communities and long-term job opportunities in the broader construction sector. The team accomplished a great deal in such a short time, a testament to the well-honed process developed using the Bower Studio projects as a testing ground. The approach, based on community development and engagement, allows the team to work directly with the community and develop joint solutions that appropriately reflect their specific needs. Working on community projects such as this has given the team valuable and privileged access to discussions and relationships within communities which creates a unique position from which to conduct further design research. On returning to Melbourne, students were asked to develop this research by producing a suite of ancillary items that complement the HomesPlus catalogue. The items were to be designed and detailed with prefabrication in mind to maximise the potential for self-building in remote communities. Bower Studio thanks the people of Belyuen for welcoming the team into their community.